Published: April 22, 2014 12:00 am Updated: April 22, 2014 11:43 a.m.
WASHINGTON — Indie rock band Portugal. 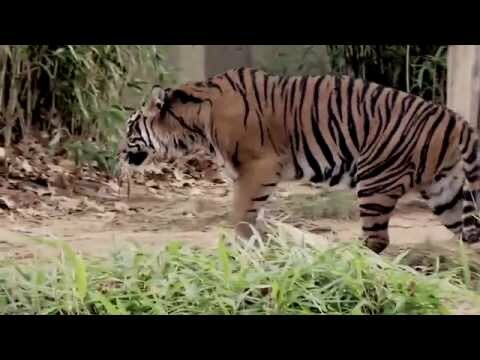 The Man and the Smithsonian's National Zoo released an "endangered song" Tuesday for Earth Day to demonstrate the dwindling number of about 400 Sumatran tigers left in the world. The new song, "Sumatran Tiger," was recorded on 400 polycarbonate vinyl records that will degrade and self-destruct after a certain number of plays. So the only way to save the song is to digitize and "breed" it by sharing the music through social media, organizers said. The song was released to 400 participants to share, including celebrities, politicians, policy makers and conservationists. It's being circulated by the zoo, the band and advertising agency DDB New York. Pamela Baker-Masson, a spokeswoman for the zoo and the Smithsonian's Conservation Biology Institute, said the music campaign is a new way to show how endangered tigers are in the wild and is meant to "inspire action." Sumatran tigers are listed as critically endangered and could go extinct due to poaching and habitat loss. The Smithsonian is part of the Global Tiger Initiative that aims to double the number of wild tigers by 2022. Zach Carothers of the Portland, Ore.-based band said they're asking radio stations and other musicians to help spread the word about tiger conservation. Several members of the band are from Alaska and grew up with a love for the environment and wildlife. "We've been able to actually see the damage that humans have done, everything from global warming, oil companies, everything," Carothers said. "We just thought this was a very original and very cool way to get the word out about endangered species in general and a specific endangered species that people might just not know about." The song carries a subtle message about conservation, he said. It was an untitled song written some time ago about Alaska's wildlife that the band reworked and finished with the title "Sumatran Tiger." "It started with growing up in Alaska and having a lot of those themes of the general cliche of 'you don't know what you have 'til it's gone' kind of idea," Carothers said. The Smithsonian created a website to help track the song's progress.